The tension was so thick, you could cut the air in our home with a knife. We were both physically present, but I had never felt further from him. 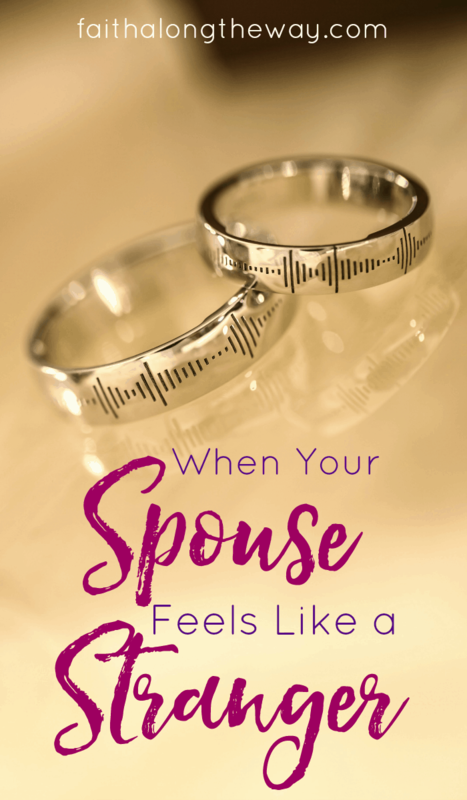 Shuffling around like polite strangers and tip-toeing around the big issues in our marriage, my heart was shattered, yet I didn’t know how to bridge the gap between us. I never thought I’d be in a marriage where my spouse feels like a stranger. Having fought, argued, and lived in frustration for almost three months, we were at a stalemate and I didn’t see a solution for our issues. Have you been there, friends? Has your spouse become a stranger and you long to reconnect? Are you wondering if there’s hope for a marriage where you feel like two ships passing in the night? May these simple steps allow God to heal the gaping wounds in your relationship, just as He used them to heal ours. When dealing with anger and frustration with your spouse, it’s easy to slip back into the same arguments, fly off the handle, and say things you’ll regret. In our marriage, it’s been helpful to set a specific time to talk, so we can both gather our thoughts and plan what we want to say in advance. Sometimes I even write down my feelings to be able to communicate with him better. When this happens we’re more likely to make progress on the issue then if we jumped into a heated discussion with both our fuses lit. Nothing diffuses anger like uniting two hearts in prayer. When angry or irritated, step away from the feelings of the situation, and pray together. 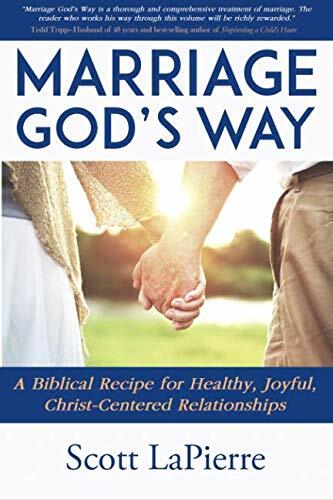 If your spouse won’t pray with you, than hit your knees yourself, bringing your marriage before the throne of the Lord; trusting that He is able to bring about healing. When I’m mad and seething, I admit that I don’t always see the truth of a situation. I’m not always clear headed, and can be blinded by my own feelings and viewpoint of the story. Sharing your heart with an honest friend, counselor or church staff will help you get an unbiased opinion and hopefully truthful counsel. In our case, after seeking wisdom, I realized that while I was wronged, I needed to forgive and offer grace in order for our marriage to move on. It was not easy to swallow, but sometimes the truth hurts and can present glaring flaws in your own feelings of justification. When I realized I needed to forgive Hubs, I had to truly let it go. Forever. I couldn’t use the situation as a weapon when I was angry or upset. I couldn’t think about the issue and harbor bitterness in my heart towards him after I claimed to forgive. I couldn’t hold a grudge against him, never truly letting God heal me from this hurt. Friends, when we claim to forgive, we have to let God fully take our pain and our burdens, and be ready to lay them down at His feet once and for all. And when those feelings of ill-will threaten to consume again, pray that God will remind you to freely extend grace the way it was lavished upon you at the cross. Sometimes in the midst of issues or seasons of distance, spouses need to reconnect and spend quality time together. There’s nothing like laughter and fun to mend a hurting heart and reunite two spirits, even if it’s forced and a little awkward at first. Don’t let the evil one manipulate your marriage into being a cold and remiss place while you work through your issues. Taking a break from the tension will help foster an environment of security and trust in uncertain times. Plus, it’s always refreshing when that old spark comes back and you realize just how committed you are to your spouse! So when your spouse feel like a stranger, know that there is hope and you can go on to have a happy and healthy marriage! Whether you enjoy a night on the town or in the comfort of your own home, make a point to talk, laugh, and enjoy each other, even if you’re in a season of distance from each other. Whether you’re locked in a current stalemate or navigating a rough patch in your relationship, remember that you don’t have to stay stuck. There is hope and rekindling your relationship is possible! God’s grace can heal all wounds! How do you reconnect with your spouse after a season of struggle and silence? Please do share how you bridge the gap between you in your marriage. Oh Sarah Ann, this is such a timely post for me! Thank you so much for sharing your experience and offering these tips. 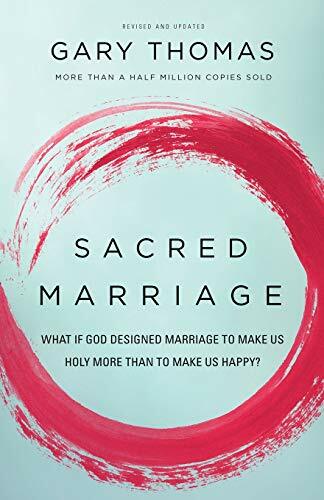 My husband and I are in the midst of a spiritual battle that is attacking our marriage. We have locked arms together with God and are engaged in the battle together. It’s hard, but I know that it will be worth it when God brings us the victory! Our usual date night consists of dinner at one of our favorite restaurants and maybe a movie if there is one out that meets our wholesome standards. Sweet blessings to you friend! Thank you so much for sharing! I know exactly how you feel and I will be praying for you! It can be a long journey, but you’re that it will be worth it when the healing comes. I feel that our relationship is stronger and more open after our struggle and I pray the same for you! Great suggestions in defusing what could potentially be a damaging marriage breaker. My idea of the ideal date night for my hubs and me; sitting at home, choosing a movie, drinking a glass of wine, eating our favorite snacks and just being together. Neither of us enjoys going out because it gets so costly, but we love being at home. We reconnect by sitting on the patio and talking. No distractions, just us. It sounds like you know exactly what you like to do with your spouse to connect! Sitting on the patio and talking sounds like such a great way to keep the spark alive. I love it! I have had to learn all of this in my 22 years of marriage and I can honestly say that while these aren’t always easy to do (especially praying with your spouse when you are hurt! ), they always bring a blessing. Thank you for sharing your wisdom with us! If we all learned to live by these simple but profound guidelines, our marriages would be better for it. May God continue to fill your cup to overflowing. There are almost no marriages that have not been at this place. It is a hard place, but one that can bring growth and a deepening of relationship. Your suggestions are good ones. Now, if I can just remember them when my Man and I are at this place in the future. Stopping in from Grace & Truth! It’s so true, Leah! Yet it’s sad that so many couples get to this point and just give up. Things in life that are worthwhile, like marriage and family, sometimes have to be fought for. A solid, healthy marriage takes lots of work! I completely agree with you. I really appreciate the point you made about taking a break from the tension and having fun. That’s super important. It is so hard to do at times, isn’t it?! I am guilty of letting my feelings get in the way of enjoying my husband at times! Always always full of practical wisdom and deep truth! This is a tough place to be in a world of selfishness, isn’t it, in a marriage where we look at the other and set aside ourself to serve and love them. And it is lonely when we feel like they are not on the same page as we are. But then remember they are a person, just like us, and somehow grace moves in and we get a glimpse of them in the light of the Father’s view and we start to see what can be. Absolutely, Dawn! Grace can be such a challenge when we think we’ve been wronged. It’s crucial that we fix our eyes on the Lord and keep focused on Him, rather than ourselves. Much love to you, my friend! These are some really great points!! Thank you for sharing! I’m glad you found them helpful! Many blessings to you! Sarah Ann, I so appreciate the hope and wisdom you offer here. Thank you for pointing struggling couples toward the help they need, and toward the redemption that is possible! This will be my feature at Grace & Truth on Friday. Thank you for sharing it with us! Thank you so much, Jennifer! 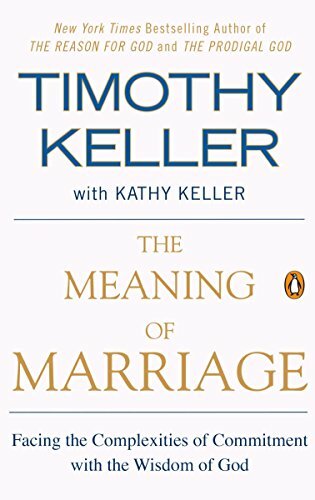 Marriage is such a blessing, but requires work to keep the lines of communication open and the two connected as one! I so appreciate the feature! Hi, Sarah Ann! 🙂 I’m happy to be stopping by your place from Grace and Truth’s linkup last week. Yes, we have certainly been in that place before! I’m so glad you suggest seeking wisdom. Several times in our marriage we have had to seek outside help, sometimes a pastor, sometimes a trained counselor. But I have never regretted the decision to do so! I also love that you suggested Reconnecting – yes laughter goes a long way toward lightening the mood between a couple. Thanks for sharing this with us! Favorite date night? When we took a blanket, a cd player and some candles out to a field and cuddled under the stars, so special. Love it! Simple but fun! One of the most important things, and hardest to live, is to let ALL the old stuff go. There is no last time you did blah, or before you did blah. If you haven’t resolved something you will not just by bringing it back up. You have to move on, as difficult as that is. This is what is happening right now and we are addressing that. This was a really hard lesson for me, I hold onto things because actions speak much louder than words for me. I had to let that go. Thanks for posting. Hello from Motivation Monday. Oh yes! It is hard but one of the most important aspects of marriage! Such good wisdom here. We definitely experienced this in our first two years of marriage, and one of the most beneficial things was setting up times to talk through things so my husband didn’t feel attacked or like he had to come up with responses on the post. We also love the idea of doing something fun and playful together after we argue to remind us what we love about each other in the first place! Thanks for sharing these great tips! Hi Sarah Ann! Thank you so for mentioning my post! What a wonderful surprise! Love you!